I would love to share my “other-worldly” new song and video, “Supernatural,” with the followers of Halloween Love. It feels a perfect fit for those who are attracted to the mysterious and mesmerizing! “Supernatural” is about the surreal chemistry of love and desire, and the intense magic of it when equally-matched. I am not sure many of us get to experience that amazing level of connection, it’s so rare! I have been asked for secrets behind writing the song. Songwriting is such a balance: art, science, energy, and inspiration. However, I am often not entirely aware of the source of the inspiration (enter more mystery- the muse-) while in that hypnotic passion of getting those lyrics down! 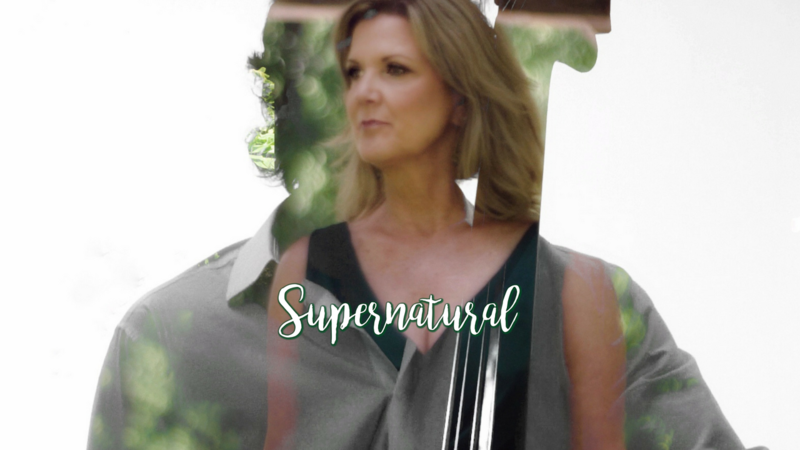 While writing “Supernatural,” I was pretty obsessed with it being clear that the relationship is especially enchanted by the balance of attraction between both partners, not one fawning over the other, but I didn’t really think about why this was so important to me. I realize now that this particular subtext is based on a few experiences of my own. I am a “soft/strong feminist” and wanted the protagonist to be the same- willing to be vulnerable, but also not allowing herself to be a victim in any way. I have realized that what was behind this is that I had a few of those #MeToo experiences. Growing up in the ’70s and in the ’80s, it wasn’t unusual unfortunately; I was clearly not alone. And then taking on a then-male-dominated profession of veterinary medicine (an injury forced early retirement for me). Well, let’s just say it’s fantastic that times have changed! I will never allow that to happen again. I wanted to model that in this song. You don’t need to be a victim to have true love. The vulnerability represented in the song comes from trust, not fear. Finding the right partner who appreciates you for your strength rather than being threatened by it can be “supernatural” in itself, as is moving beyond the memories of the past! Honestly, though, that was not the original idea behind the song, just a cool message that emerged while creating it. The title and concept were originally inspired by the fact that we, as artists, can bring what is natural into the supernatural realm by creating with two super organic instruments (the voice and the bass), and employing dynamite musicianship while allowing for “magical” embellishment with synthetic tools at hand. I created the groove and chord changes, and a little melody, and, in my mind, the song began to shimmer. Lyrics came through for me at times spontaneously and at times begrudgingly, inspired by the whole storyline of ethereal and singular love that is truly equal on many planes: physical, spiritual, and intellectual, and from one partner to the other. It all felt so right- so supernatural. My producer and co-writer Aaron Zinsmeister took my rudiments and created that fantastic arrangement, which also by the way represents a surreal balance between the vocal textures and the layering of bass, brilliantly performed by bassist Timothy Perkins. We worked the lyrics hard to get that “powerful, kinetic connection” across, and the music to support it, so even the lyrical content and the track are in balance. I hope the song and video are something you will enjoy! A notable creative presence on the Wisconsin music scene, Rändi Fay defies the limitations of genre in her fusing of the softness of nostalgic artists from the past, including the tonal richness of jazz to the emotional drama of contemporary symphonic pop. Her poetic lyrics, dynamic melodies and transcendent vocals captivate listeners. Four time Wisconsin Area Music Industry “Jazz Artist of the Year” nominee (2015, 2016, 2017 & 2018) and two time UK Songwriting Contest semi-finalist ("Winter Wind" & "Freely Given" 2017), whether live or within her prolific studio work, Rändi’s music mesmerizes, inspires and connects.